Marina (Daniela Vega) is planning a future with her boyfriend Orlando (Francisco Reyes) when he suddenly becomes ill and passes away. She is devastated and immediately feels the sting of discrimination as a transgender woman when hospital staff and Orlando’s ex-wife and son challenge her right to grieve and the viability of her lost relationship. Marina is defiant in the face of oppression, though, as the film follows her around with stunning fantasy set pieces revealing her inner life. 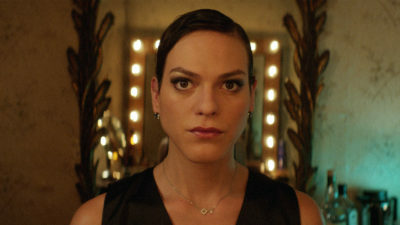 Lead actor Daniela Vega collaborated with director Sebastián Lelio on the script to bring an authentic trans experience to the story. As a result, A Fantastic Woman represents a positive leap in representation of trans women in cinema. Introduced by SQIFF Festival Coordinator, Helen Wright. Film is in the Spanish language with English language subtitles/captions. An Lanntair has good access for wheelchair users. lease email access@sqiff.org for more details on venue access.